The all new Audi Q2 is a stylish crossover that combines both compact 4x4 and hatchback looks. The Q2 is a guaranteed head turner with bold styling and attractive features. 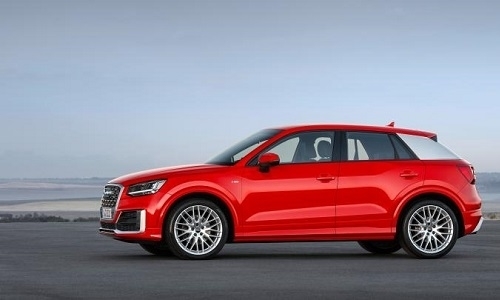 If you’re looking for a vehicle that is suitable for all your family’s needs as well as looking pretty doing it, then the all new Q2 is a great choice for you. The Q2 can comfortably seat 5 adults and has a boot space of 405 litres which increases to 1050 litres when the rear seats are folded so space is not at a premium. Be one of the first to lease the brilliant Audi Q2. The Audi Q2 comes in four different trim levels, the entry level SE, then the Sport, S Line and the top of the range Edition 1. The Audi Q2 SE comes as standard with features such as 16” 5 Spoke design alloy wheels, Automatic start stop, Body coloured door mirrors, Manual air conditioning, 7” Colour screen, Bluetooth, Voice control system, 2x USB charging points and 1x Aux in and ISOfix child seat mounting points. The Audi Q2 Sport comes as standard with features such as 17” 5 Arm start design alloy wheels, Automatic start stop, Body coloured door mirrors, Manual air conditioning, 7” Colour screen, Bluetooth, Voice control system, 2x USB charging points and 1x Aux in, ISOfix child seat mounting points, Satellite Navigation, Front sport seats and light and rain sensors. The Audi Q2 S Lines comes as standard with features such as 18” 5 Spoke Y design alloy wheels, Automatic start stop, Body coloured door mirrors, Manual air conditioning, 7” Colour screen, Bluetooth, Voice control system, 2x USB charging points and 1x Aux in, ISOfix child seat mounting points, Satellite Navigation, Front sport seats, light and rain sensors, LED headlights with LED rear lights and dynamic rear indicators, Dynamic suspension, S Line design body styling and a 3 Spoke leather trimmed multifunction sports steering wheel. The Audi Q2 Edition 1 comes as standard with features such as 19” 5 Arm rotor design alloy wheels in gloss anthracite black in a diamond cut finish, Automatic start stop, Body coloured door mirrors, Manual air conditioning, 7” Colour screen, Bluetooth, Voice control system, 2x USB charging points and 1x Aux in and ISOfix child seat mounting points, Black styling pack, Front sports seats, LED headlights with LED rear lights and dynamic rear indicators and sports suspension. To see a selection of Audi Q2’s check out our manufacturer’s page.